Kyushu's commercial and entertainment hub, Fukuoka is often cited on international "Best of" lists for its culture, lifestyle and business climate. One of Japan's oldest and largest cities, Fukuoka often feels like more of a cozy, friendly town than the lively, energetic city it actually is. Visitors to Fukuoka will find themselves in an enjoyable seaside city with excellent transport links . Fukuoka International Airport is a mere 10 minute subway ride from the centrally located Hakata Station. Shinkansen bullet trains run regular services to Fukuoka making travel around Kyushu or from major centers on the main island of Honshu simple and convenient. 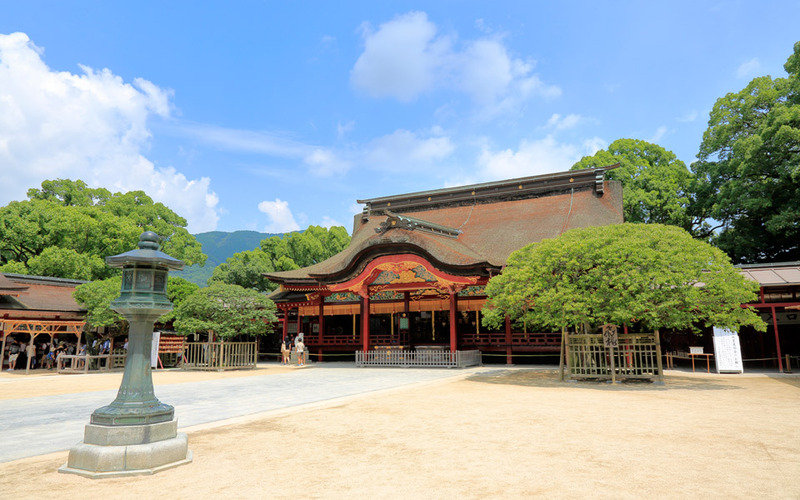 Once arrived in the city, travelers will find a city well-connected by a network of subways, surface rail lines and bus routes making Fukuoka one of Japan's most easily reached and navigated cities. Enjoying a more moderate climate than other areas of the country, Fukuoka seldom has temperatures below 0 during the winter and snow is a rare thing indeed! While the rainy season in early summer can see large amounts of rainfall, Spring and Autumn are often very pleasant while summers are hot and humid but alleviated by refreshing ocean breezes. Festivals run throughout the year and visitors will find a wide variety of attractions both natural and modern. Any visit to Fukuoka will certainly involve sampling the local cuisine. Fukuoka is rightly famous for its seafood and roadside food stalls. Every evening small food stalls set up all over the city with Nakagawa and Tenjin being the most famous. Simply follow your nose and have a seat! Hakata Ramen is a bowl of ramen noodles in a tonkotsu pork broth that draws crowds of enthusiasts from all over the country throughout the year. Mizutaki is a flavorful nabe hot pot dish made with a slowly simmering fresh chicken-stock base to which more locally produced chicken and vegetables are slowly added. Motsunabe is a savory nabe hot pot dish of slow cooked tender beef innards, miso soy paste and soy sauce with fresh vegetables. A local favorite now popular all over the country, motsunabe is well worth a try. Tenjin and Tenjin Underground City. 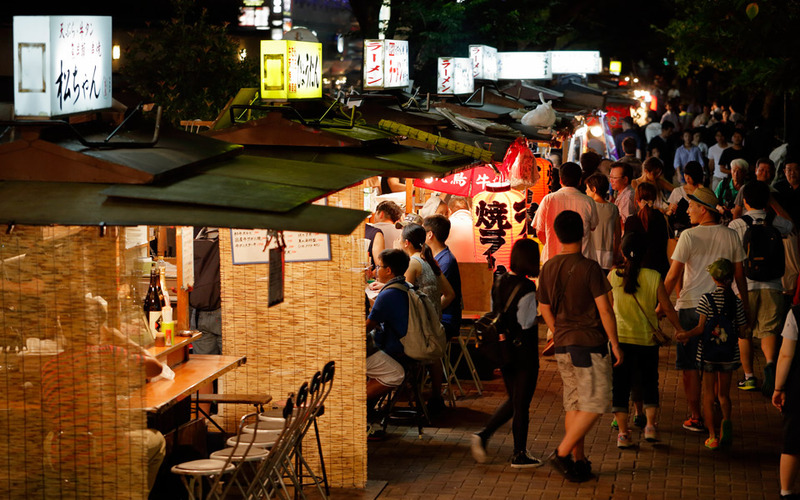 An avenue abounding in shops, yatai food stalls, department stores and restaurants, there is as much to enjoy at street level as there is in the underground shopping arcade! Canal City. A multi-story entertainment centre with a massive variety of shops, restaurants and theaters with calm canals, seasonal displays, stage events and much more. Ohori Koen Park. 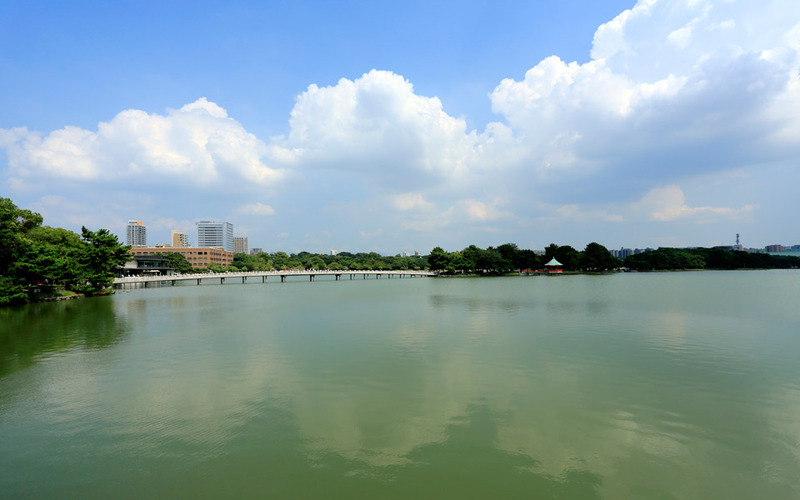 Enjoy a stroll through an oasis of green on the nearly 2 km of walking trails throughout the park as it winds its way around large ponds and water fountains. Tochoji Temple. Famous for its giant wooden Buddha housed inside the temple building. Festivals in Fukuoka, in keeping with the character of the local people, are generally lively, loud and great fun! Tamaseseri matsuri Festival is a Shinto ritual to help secure a good harvest. Every January, two teams of men in traditional wear (fishermen vs farmers) go ahead to head in an all out competition for a small ball. The team that captures the ball and is able to hand it to the head priest of the temple is said to ensure a rich harvest or excellent catch for the year. Hakata Gion Festival is Fukuoka's largest festival and draws visitors from all over Japan and the world. 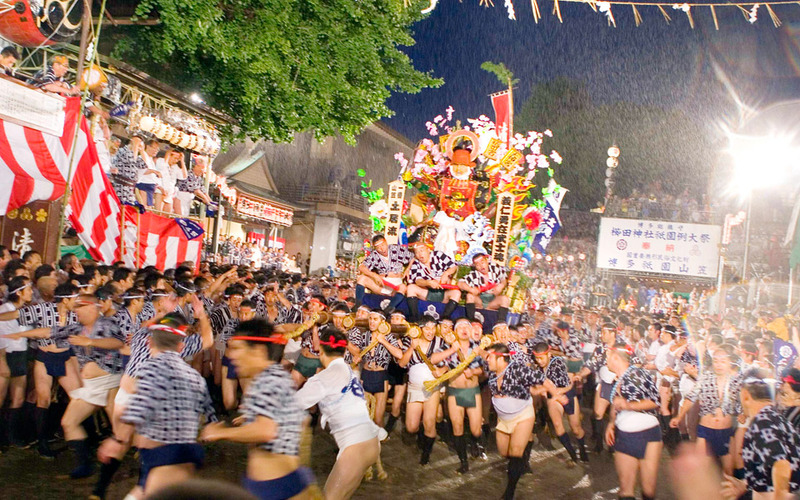 Held every July to mark the beginning of summer, events such as ornate floats drifting down the canals and tradition dancers build toward an astonishing climax on the last day of the festival-the Oiyama race. Teams of men carrying heavy floats on their shoulders race through the streets of Fukuoka towards the finish line while thousands cheer them on. Hakata Dontaku Port Festival. During the first week of May, one of Japan's largest community festivals dominates Fukuoka. Dating back nearly 800 years, the Dontaku Port Festival is a huge parade with 10,000s of participants and many more spectators. Dressed in a variety of traditional costumes, young and old dance alongside fantastic floats as the wind through the city streets.